STORRS - Yes, it survived. But the UConn women’s basketball team wasn’t thrilled with how it advanced to its 26th consecutive NCAA Tournament Sweet 16 Sunday night. The second-seeded Huskies earned a spot in the Albany (New York) Regional semifinals by holding off No. 10 Buffalo 84-72 at Gampel Pavilion and will face sixth-seeded UCLA on Friday at 7 p.m. at the Times Union Center. UCLA advanced to Albany with an 85-80 victory at No. 3 Maryland on Monday. Top-seeded Louisville will take on No. 4 Oregon State in the second semifinal Friday. UConn (33-2) scored the first 15 points against Buffalo and led by 24 in the third quarter and by 18 going to the fourth. But a free throw by Brittany Morrison capped an 18-2 run and brought the Bulls (24-10) within eight with 2:36 left. But baskets by Napheesa Collier and Megan Walker kept Buffalo at a distance and the Huskies put it away by hitting five of six free throws in the final 1:01. “I definitely don’t think we came into this complacent at all,” UConn guard Katie Lou Samuelson said. “Just the way the game played out we would go on runs when we were attacking, attacking, and then we would kind of just treat it like other games. This is the NCAA Tournament and there is definitely not going to be anyone that just gives up. So for us, understanding that and knowing that we have to be in that killer mentality throughout the entire game is important. Collier recorded her fifth straight postseason double-double with 27 points, 16 rebounds, eight assists, and three blocked shots over 40 minutes. Samuelson, in her second game back after missing four games with back problems, also did not come out and had 17 points and nine rebounds. Freshman Christyn Williams had a hot start and matched Samuelson’s 17 points. 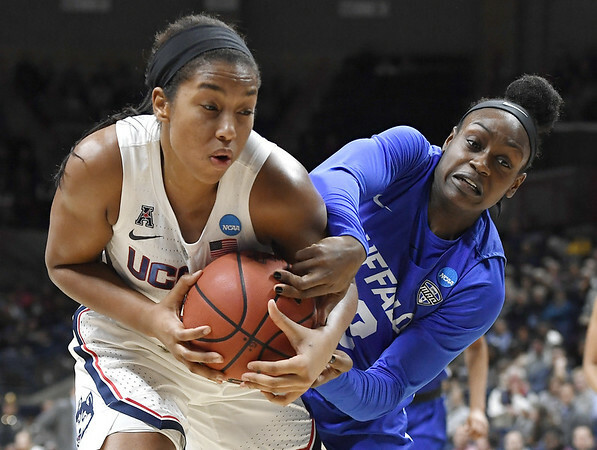 But Dangerfield, while she did reach the 1,000-point plateau, was not at her best and sat out the final 4:10 of the third quarter - when Buffalo started its run - with four fouls. Megan Walker was just 4-for-16 from the floor, with many of those misses in the lane. Freshman Olivia Nelson-Ododa was the only player to see action off the bench and the Huskies were outscored by 11 in her 11 minutes of action in place of foul-plagued Williams and Dangerfield. The Huskies lost the battle of the boards 48-45, and Buffalo’s 26 offensive rebounds led to 28 second-chance points. UConn also committed 21 fouls with Walker (3) the only starter not to finish with four fouls. It was the Huskies’ closest second-round win since they beat Xavier here 86-84 in 1999 as Tamika Williams’ two free throws with 7.1 seconds left capped a game-closing 8-0 run. The last time that UConn trailed in the second half of a second-round game was against Wisconsin-Green Bay in Hartford, but it went on to win 94-70. “When Diana Taurasi played and we won a national championship (in 2003), we were down at halftime to TCU and she had 35 for us to win,” Auriemma said. “A lot of new fans might not remember, but winning these games is not easy. It is a struggle. It should be a struggle. It is a struggle for a lot of different reasons. All of a sudden shots that we make regularly, we don’t make. Why? Because it’s the NCAA Tournament. We’ve been shooting 80-some percent from the free throw line, and now all of a sudden free throws don’t go in. You play against another kid and that kid goes 4-for-100 but not in the NCAA Tournament. Or things that aren’t fouls are fouls and things that are fouls aren’t fouls. The Huskies’ 26-year run of regional berths is the longest current streak and the second longest all-time to Tennessee’s 27 (1982-2008). Stanford has the No. 2 current streak as the Cardinal made it 12 in a row by beating Brigham Young Monday night. Their first regional berth came in 1991 with a one-point win over Toledo. It will be the second Sweet 16 meeting with UCLA in three seasons, with the Huskies eliminating the Bruins in Bridgeport in 2017. The UConn-UCLA and Louisville-Oregon State winners will meet Sunday at noon for a spot in the Final Four in Tampa, Florida. Posted in Newington Town Crier, UConn on Tuesday, 26 March 2019 20:29. Updated: Tuesday, 26 March 2019 20:32.